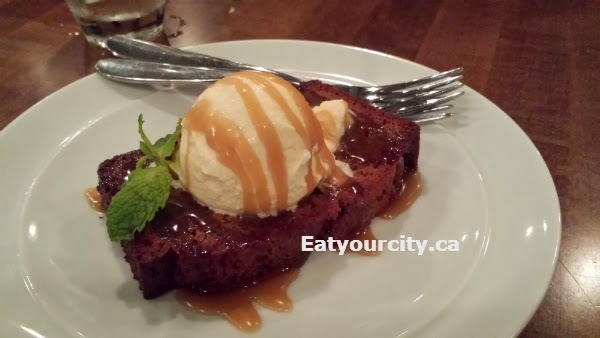 Eat Your City: Belgravia Hub Edmonton, AB - lovely spot for a drink with friends, food and amazing desserts! 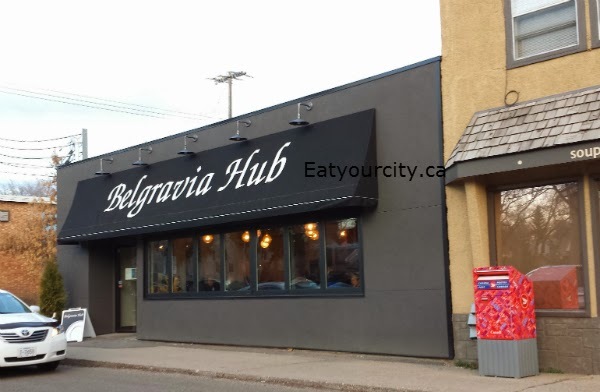 Belgravia Hub Edmonton, AB - lovely spot for a drink with friends, food and amazing desserts! We've driven by countless times by Belgravia Hub – a little restaurant nestled into the neighborhood by the University Campus, and one night, as I didn’t feel like cooking, we headed here to try out their fare… and we’re glad we stopped by this quaint and welcoming little spot to fuel up and relax. 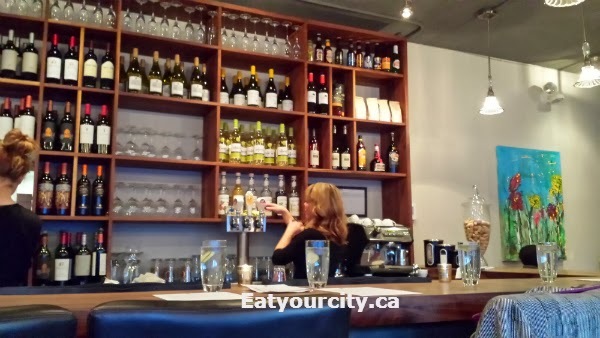 Reservations are recommended for this little spot with a small amount of seating surrounding a gorgeous large bar. It’s a place meant for a quick drink over a meeting, or a casual yet upscale meal with friends. Service is exceptional, with friendly (but not overbearingly so) waitstaff. The atmosphere is akin to stepping into a friend’s living room (mine you, a friend who happens to be an exceptionally good chef!). On to the food! 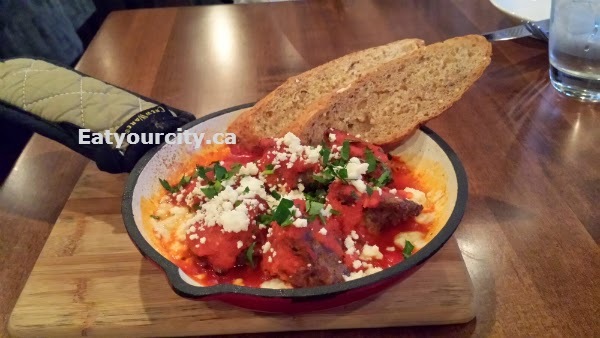 We started off with the Lamb meatballs with marinara, feta, fresh bread. 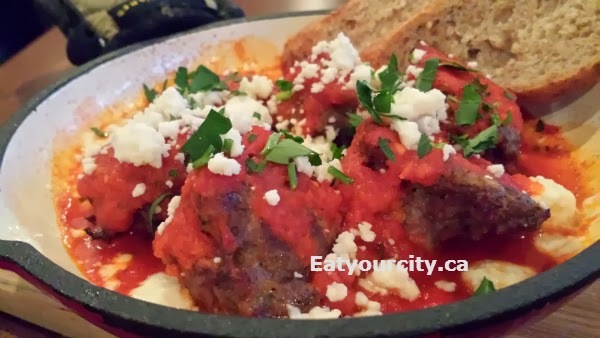 The meatballs were large, tender and well seasoned and this appetizer was easily an appy for 4, not the two of us. Really enjoyed the well simmered and smooth marinara sauce, though not the bread that was served with for dunking… I prefer my rustic breads toasted or as buns, but that’s just a personal preference. 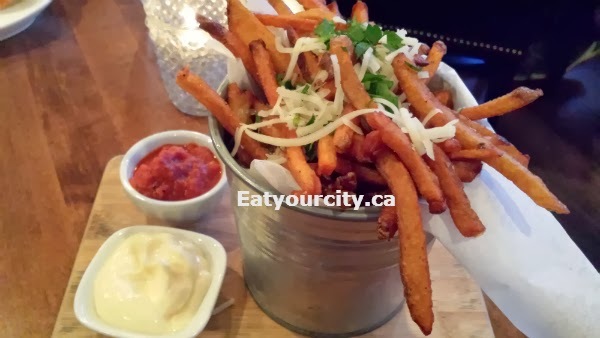 We also had the Garlic parmesan potato shoestrings with Hub seasoning, garlic aioli, smoked ketchup to start as I was hankering for something unhealthy. 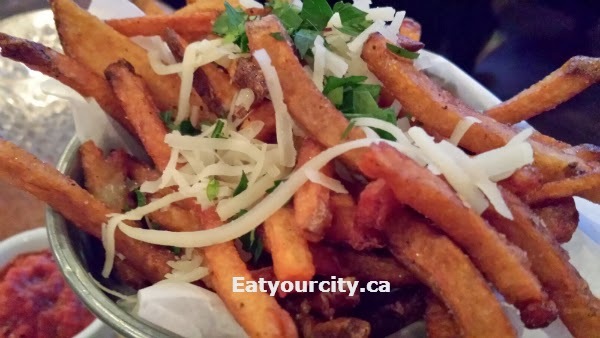 And though a bit on the pricey side, these fries were excellent with the shaved parm and dunked into the garlic aioli. The smoked ketchup was a nice touch. 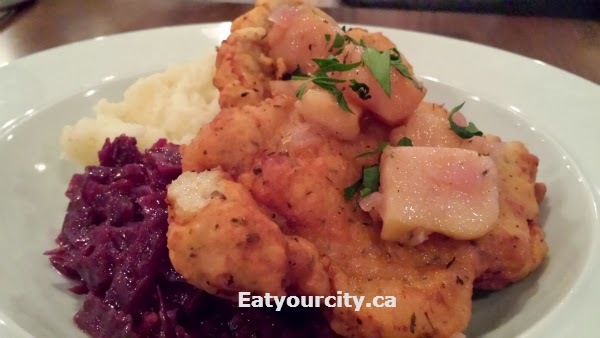 For entrees, my boyfriend ordered the Prairie Pork Schnitzel with garlic mash, braised red cabbage, apple compote. 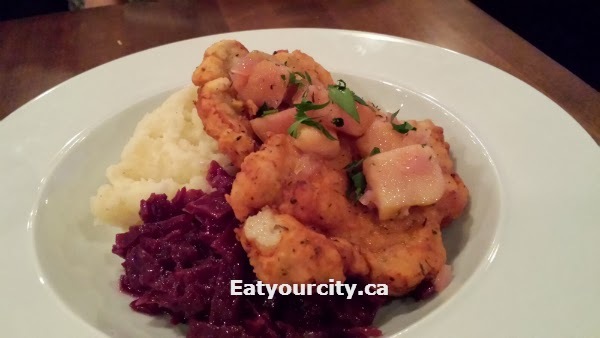 The pork schnitzel had a nice crispy batter, and cooked to perfection with the interior nice and moist. The schnitzel was pounded flat a bit unevenly, so the thinner bits were dry. The garlic mash was super creamy with a nice hit of garlic, while the cabbage and compote added in sweet and tangy elements. Nom! 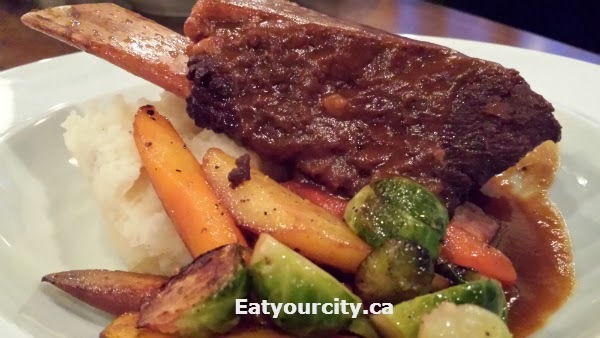 I went with the Beer braised shortrib with garlic mash and veg which caught my eye. 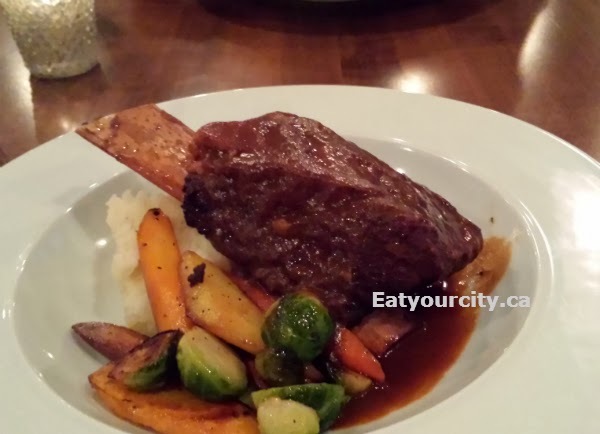 The shortrib was fall off the bone tender, moist bites of awesomeness. The rib was braised in simply beer and a few herbs, which is fine by me as it really let the flavors of the beef shine. It was served with the same garlic mash as the Pork Schnitzel, and the sweet roasted vegs was a nice complement to the dish. 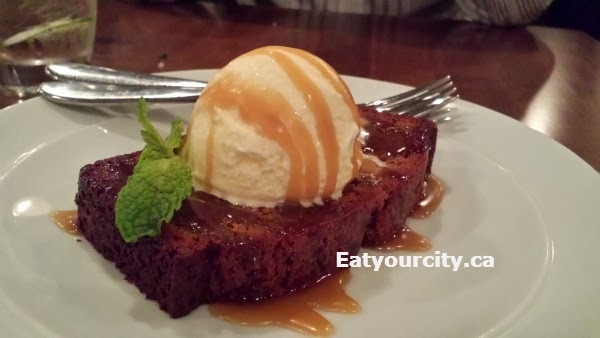 generously drizzled with a rich caramel bourbon sauce and topped with vanilla icecream and whipped cream. Food-gasm Nom! 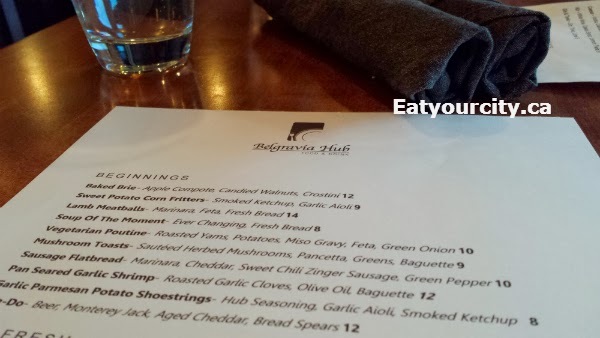 So if you’re in the area, do drop on by and you won’t be disappointed in this neighborhood’s foodie gem where its evident the chefs and staff are passionate about making Belgravia Hub a restaurant to stay a long long time. Oh, and make reservations cuz they are busy busy busy!